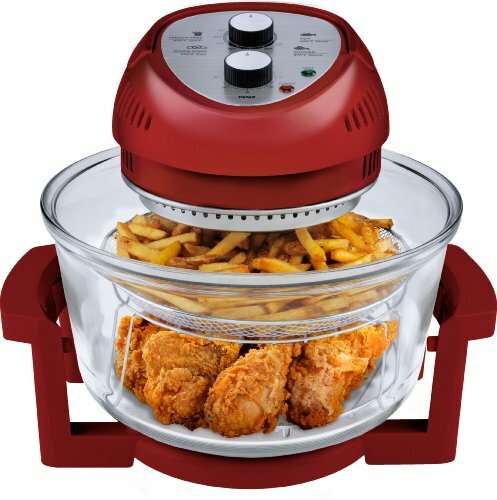 You can enjoy crisp fried potatoes and fresh chicken wings without the spatter, odor and added calories of oil with an air fryer. This small batch machine doesn’t need a lot of counter space and cooks by crisping food in hot, moving air. Air fryers make French fries almost guilt free! The NuWave Brio Air Fryer ticks all the boxes for us. We love the ability to cook at low or high temperatures. It’s also extremely versatile and can bake as well as fry. You’ll be pleasantly surprised at how delicious your fries and chicken wings are. 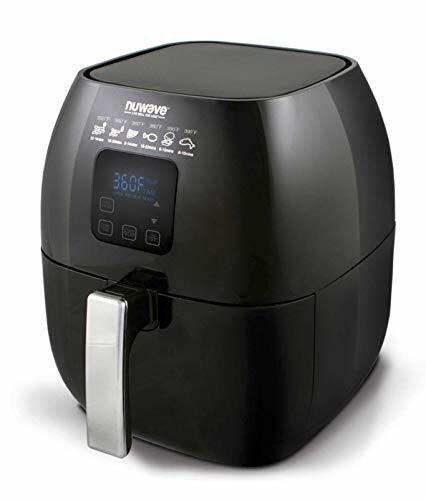 You will need very little seasoning or oil – if any – but the full flavor of the foods you are cooking are unlocked within this great appliance by NuWave. In this guide, you will learn about the health benefits of air fryers and discover the best air fryer for you and your home through our air fryer reviews and comparison chart. If you’d like to reduce the amount of fat in your diet but continue to enjoy your favorite fried snacks and side dishes, an air fryer can be a great investment. 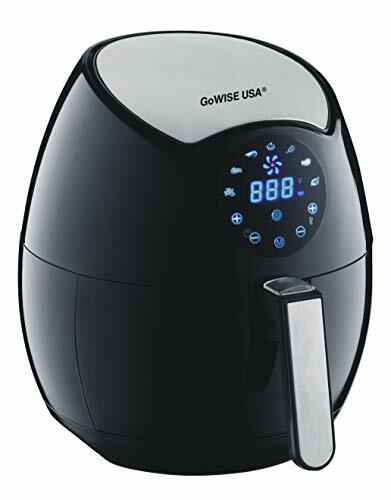 Check out the following video of the GoWISE Electric Air Fryer. Deep frying foods at home can take a great deal of oil and time. Additionally, once you’re done, you’ve got oil left to either try to re-use or discard. Hot oil in the kitchen can be extremely dangerous and will leave a spattered mess on countertops and cabinet surfaces. Finally, deep-frying can leave a lingering odor in your home. Previously fried foods such as frozen potatoes generally have fat included in them already, so cooking them in an air fryer won’t make them fat-free. However, you will greatly reduce the amount of added fat in your cooking by switching from oil to air. 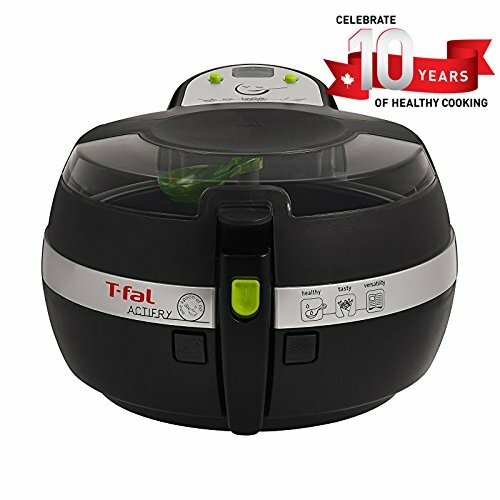 You will probably need to brush any raw, unprocessed foods with a bit of oil to get them to crisp up in your air fryer, but you will greatly reduce the fat content of standard oil deep frying techniques. The Phillips air fryer has an incredibly simple user interface. It has a unique “starfish” basket that purports to cook your food completely evenly. It’s even endorsed by celebrity chef Gordon Ramsay! It’s powerful enough for oven and waffle fries, chicken, fish, and other pre-cooked frozen foods you might find in your freezer. Many of its competitors offer fancier interfaces and more bells and whistles. You don’t have to press any buttons to start cooking with this Phillips. The “starfish” design and any claims of cooking food more evenly than other air fryers are somewhat suspect. Air fryers by nature do an excellent job of circulating heat throughout the entire cooking chamber. You’ll get excellent, evenly cooked food out of this Phillips, but we think you’ll get the same excellent, evenly cooked food out of most of our other picks here. Overall, the build quality and ease of use that this fryer offers make it a stellar choice for any kitchen that needs an air fryer. If you’re not too worried about internal capacity and this unit is within your budget, give it some consideration. 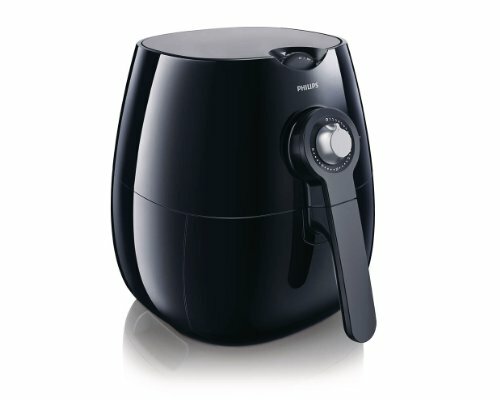 The GoWISE GW22621 3.7-quart air fryer cooks between 175F and 400F. It has a built-in timer and a variety of presets to make cooking common foods fairly simple. Like other air fryers, this machine offers great performance when cooking poultry, frozen foods, and vegetables. You can comfortably fit a small chicken inside this machine, and it’ll come out wonderfully, as long as you fully defrost it first. The wide range of available temperatures allow you to incorporate this air fryer into almost any recipe without too much hassle. However, the heating element in this unit isn’t insulated from the food in any way. This isn’t unusual, but it’s worth noting that you shouldn’t cram as much wet food as possible into the basket. Any juices or liquid that splash upwards will wind up on the heating element and make a lot of smoke. Things will still work fine, but your kitchen might smell like something’s burning. The non-stick coating on the fry basket may have a shorter lifetime than some other nonstick cookware. Be sure to check the manufacturer’s website to see how much a replacement basket costs. You may find yourself replacing it within the first year of use. The T-fal Actifry air fryer has an automatic stirring mechanism to ensure even cooking. It has a steam resistant window to so you can watch your food as it cooks, and the ceramic nonstick pan is removable to keep cleaning simple. The stirring mechanism is fully removable for recipes that you think are better left alone. It’s quite convenient for seasoning many recipes since you don’t need to mix things before starting the cooking process. As far as heat goes, air fryers tend to heat things extremely evenly already. We’re not sure that stirring things as you heat them is necessary. The T-fal doesn’t have any sort of temperature control. It’s either on or off. This is a reasonably large downside compared to all of our other picks: you can’t reheat things at low temperatures or adjust how crispy you want your chicken skin. In T-fal’s defense, most air fryer recipes are at pretty similar temperatures. We’d still rather have a bit more control over how we cook things. The Big Boss air fryer has a beautiful clear bowl to let you look at food as it cooks. The large capacity and unique aesthetic make it perfect for hungry families that want a conversation piece on the countertop. The bowl in this unit is much larger than many competing air fryers. You’re able to fit about eight times as much food in here as you can fit in the Phillips. It has two separate internal trays so you can keep two recipes separate while cooking both at the same time. Capacity comes at a cost, however, and the cost here is accuracy. The temperature controls on this unit don’t appear to be well calibrated. When it comes to actually cooking, this Big Boss does an amazing job. It handles raw meat, frozen food, vegetables, and even some baked goods with ease. This unit manages to be less expensive than many convection ovens while offering more capacity and similar functionality. The NuWave 3.5-quart air fryer has a dishwasher-safe basket and simple LED control panel. With temperatures ranging from 100F to 390F, this unit should be able to cook anything you can throw at it. Low temperatures make this perfect for reheating things from your fridge, while the higher end is great for getting a crispy skin on chicken and cooking food quickly. The fries that come out of this machine are comparable to what you’d get out of your best deep fryer. With a little legwork, you can even get restaurant quality fries by double cooking. This unit has a preheat function for accurate cooking temperatures. While the heating element delivers consistent, powerful heat, it takes a bit longer to preheat than we’d like. Of course, it’s still faster than a full sized oven. The non-stick basket is slightly less non-stick than some other models. You’ll probably find yourself using a stiff brush to clean the inside of this unit at some point. You won’t have to scrape bits of chicken off of it after each use or anything, but some oil will accumulate over time and make things sticky. The air fryer is functionally a small and very intense convection oven. You can take the time to experiment and get creative with your air fryer by adding a bit of water to poach fish or grill a small piece of beef. Do air fryers really work as fryers? Yes. They also work as ovens and grills, so have fun! Luckily, a few air fryer manufacturers, such as Phillips, have teamed with well-known chefs to produce cookbooks that offer home cooks the chance to try new techniques with their air fryer. Our top pick, the NuWave Brio Air Fryer, also comes with a cookbook. The unit is beyond easy to use and does a great job of producing food so juicy and tender, you’ll wonder why you ever bothered to eat greasy fried food! Don’t overload the hopper and don’t leave your air fryer unattended! Have fun experimenting with this appliance, and eat healthily!